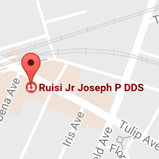 Dr Simons has been Dr. Ruisi's associate since September 1995. She is the mother of two sons, who along with her husband take up all her time when she isn't practicing. Dr Jacqueline Simons graduated from Brandeis University with a BA in Biology in 1988. After receiving her DDS degree from Columbia University School of Dental and Oral Surgery in 1992, she remained there to complete a year residency in general dentistry. While there she was a member of the Alpha Omega dental fraternity and was awarded commendations by the Women in Dentistry organization. Dr. Simons completed her fellowship in Orthodontics from Columbia University School of Dental and Oral Surgery in 1995. She completed a fellowship in cleft palate and patients with craniofacial malformations in 1996, also from Columbia University.